Not Paris but who cares. For those who have been following along for a while, you may recall last year when, after 18 months of living the fast life in Sydney, we made the decision to bring the family back to the simpler life we had spent the previous 10 years building in Tasmania. We thought it would take 6 to 12 months to make it happen. However, instead of doing things like a 'normal' person and finding a new job before leaving a current one, in true mid-life crisis fashion, The Pianoman ditched the big corporate job and with no job keeping us in Sydney we sold most of our worldly possessions, bought a caravan, packed up the house, the Kidlets and the Whippet and less than 3 weeks later we were travelling around Australia. The money would last around 3 months and we hoped that would be enough time to find another job while on the road......it was and looking back it was the best decision we could have made. The only little thing was that on our fridge were 2 return tickets to Paris which were booked for our 10 year Wedding Anniversary last December. This is a trip that we have been planning for around 10 years. It had almost become a bit of a joke among our friends. If one of us had a bad day we would get "don't worry only 6 years until Paris isn't it Mel!" or when I had done nothing all day but breastfeed the twins around the clock and was up to my eyeballs in nappies I would joke "it's OK, only 4 years until Paris". The Paris trip was symbolic of the desire to spend some decent quality time together without the children - something we haven't done together in our 8 years of being Parents - and to celebrate the end of changing nappies every single day for a period of 7 years, 4 months and 8 days. The destination was really secondary to us being together. I still maintain I would be perfectly happy being on a plane for 24 hours and simply enjoying reading a magazine from cover to cover and sipping on champagne without anyone sitting on my lap. Bliss! We do go out together and have had weekends away individually so we do get a little break from time to time while the other one stays at home with the Kids. But aside from Weddings or Funerals, the only time we have been away together just the two of us without Kids was a 2 night camping trip 5 years ago. On that trip I think we were so unaccustomed to finishing a sentence without interruption that my body went into shock and I came back pregnant with Twins. I'm already pregnant now so I can't really get myself into too much trouble with another trip sans Kids. When The Pianoman left his job in Sydney, what we really needed was to have time together to decompress and 3 months travelling around the country trumped 10 days in Paris. We couldn't get a refund on the tickets but vaguely thought we could postpone it for a year. So I recently enquired about said tickets and was informed by British Airways that the tickets had to be used within 12 months of the date of purchase. We bought the tickets last July. It was now June. Oh Dear! So it seems we have to go on a holiday by NEXT WEEK (cue the mini-violins!). We were also informed that we couldn't get to Paris anyway because the tickets we purchased were low season December tickets but we are now in June which is double the price being peak season. We actually don't have the time or the money to spend on a trip right now so we can only go as far as the credits will allow. And somewhere cheap. We also had to fit a potential trip around the in-laws, who were all set to look after the Kids last December while they were on school holidays themselves from the jobs in the teaching profession. Fortunately, they are on school holidays now and are making their way from Alice Springs down to Hobart as we speak. It's a big ask and we are so grateful for them for allowing us this little indulgence. So the Paris trip is now the "Paris" trip. We are actually off to Vietnam this Friday! Nothing has been planned because that's just how I roll and you probably also know by now that I don't like to plan things. Planning takes away all the fun for me. I didn't want to cause the in-laws any angst though so the flights have been booked. Anyone been to Vietnam? Or Paris even? Did you love it? Have you done a "Paris" trip or have one on the horizon? Have fun Mel it will still be great. My parents went last year and my brother and sister in law have been too. Their main advice was that take your own toilet paper everywhere you go, take extra money and buy fabrics and have some clothes tailor made for you. Also check out the web for suggestions about what to take. Can't wait to see the photos. Never been to Vietnam however I have been away without the kids overseas twice. (Does that make me sound like a horrible Mum??) Each time my parents have had them and The Farmer and I have had a week to two week trip away. I missed them but not so much I didn't enjoy myself and it was fantastic for the two of us to hang out together. Enjoy! "Paris" is just what you need right now. And I would love to be on a plane with an empty lap, it's been 8 years! Gosh, love the way you roll. How exciting. Can you get pregnant if you're pregnant? Enjoy your trip sans les enfants. Mel this is awesome!!! 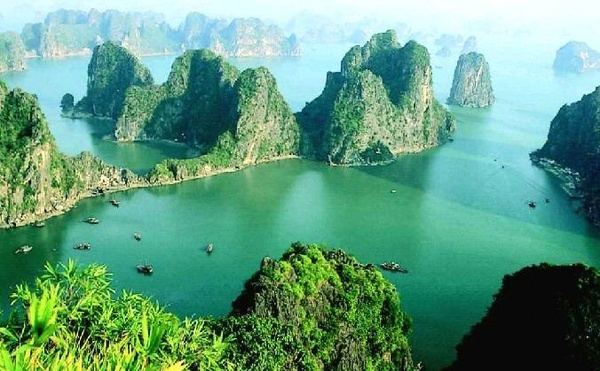 Vietnam is on my list of possible holiday destinations for when my kids get a bit older. I've read a few books set there and really look forward to hearing all about your trip! Have an amazing time. I think I just might set up a 'Paris Trip' for Hubby and I. Got to love a lawyer who doesn't like to plan - so there is no 6 minute incremental detailed spreadsheet of what you're doing?? Brilliant. But without children, how much planning do you need to do?? You look so young & glamorous, i bet people will nod "oh your first child, is this a baby moon" or some nonsense, then fall of their bar stool when you say "5th" with glee. Took us 13 years to reinact our honeymoon (the Italian leg of it anyway, with Greece & Croatia thrown in as new adventures) after 4 babies (aged 6 to 11 at the time) & it was so deserved. We are technically still young enough for people to assume it was a honeymoon, especially when i booked the same hotels in Rome & Venice. Our children still use the word 'abandoned' when we talk about the last European trip, but they've been to Disneyland, that's an ace we've been using for 5 years now, possibly wearing thin?? Oh WOW Mel! That is SO cool. That means ALL of you are going then?? What a great story, shame about Paris, but this one will be equally as fun. Maybe set your sights on Paris in another ten years time!? I know what you mean about never getting away together, just the two of you... we're the same. Though we've only been doing the parenting gig for four and a half years, so really babes in the woods, haha. We too had aspirations to go to Paris for last years 10th Wedding Anniversary, but it didn't happen due to a number of reasons. The first being that we hadn't saved up for it. However, we are looking at the 3 of us going in 12-18 months for a months stay, and I have just started French lessons this year. We now have a dedicated "France Fund" bank account and we are focussing on saving up the cash first, so that we can enjoy ourselves without debt. Have a great holiday, particularly escaping the Tasmanian winter! Mel, so darn, jump up and down exciting!!! Firstly, you are in Paris, I mean Vietnam. And thirdly... You are growing a baby!!! A huge congratulations! How exciting, I hope you've had a wonderful trip, Vietnam is supposed to be so beautiful.